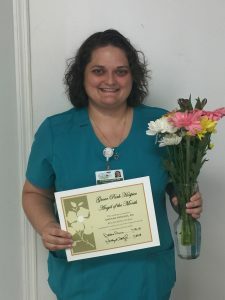 Grove Park Hospice recognizes Amanda Peeples, RN as Angel of the Month! Amanda’ says she loves being a hospice nurse and it is the most rewarding job she has ever had. Amanda is a highly skilled nurse who demonstrates compassion in the care she provides. Amanda often goes above and beyond the call of duty: even taking a grieving family member shopping for funeral clothes. We are very proud to have Amanda on our Grove Park Hospice team!